This collection comprises 61 black-and-white photographs taken and printed by Civil War-era photographer George N. Barnard. Barnard held the post of official photographer for the United States Army, Division of the Mississippi, and traveled with Gen. William Tecumseh Sherman during his Atlanta Campaign and his March to the Sea in 1864. Barnard began his work with Sherman in Atlanta. He returned to the South in 1866, after the war ended, to record images of the aftermath of the fighting. Barnard solicited advance sales and then published a book of the photographs that he hand printed and mounted. He produced 100 to 150 copies of the book, approximately 50 of which went to European collectors, and Union generals ordered many of the other copies. The Wisconsin Historical Society holds a copy in the archives, which archivists scanned to create this image gallery. Barnard took the images for this book with a 12-by-15-inch camera. He often used trees as stand-ins for human subjects. As an example, in his picture of Pine Mountain he uses a lone tree to symbolize the Confederate General Leonidas Polk's death. In his photographs taken at Resaca he symbolized the ferocity of the fighting with shattered trees. People in his photographs are often staring into the distance rather than at the camera. Barnard often superimposed clouds into the sky of his pictures because they appeared more realistic than an overexposed, white sky. He used collodion wet-plate negatives that are overly sensitive to blue, resulting in skies that would often appear overexposed. Sometimes the presence of trees complicated the process of double printing clouds in the sky, and he would solve this problem by cutting off the tops of trees. All of the images in the album are contact prints on albumen paper. With the election of Lincoln at the end of 1860 and the secession of Confederate states, Washington D.C., began to fill with troops. Having had working relationships with two of the most important figures in photography at the time, Edward Anthony and Mathew Brady, Barnard arrived in Washington a few days after Lincoln's inauguration and began working for both Anthony and Brady. He took portraits of individuals as well as troops in the field. Barnard was present at the First Battle of Bull Run on July 21, 1861, but did not take any pictures. When Confederate troops withdrew from the area in March of 1862, Barnard returned to the battlefield and documented the destruction, as well as several of the houses in the area associated with the battle. In June of 1862 Barnard traveled to Yorktown to take photographs of the ruins created by battles. He took a break from war photography and concentrated on portraiture for the rest of 1862 and most of 1863. In late 1863 Barnard took a position as the Army of the Cumberland's head of photographic operations. 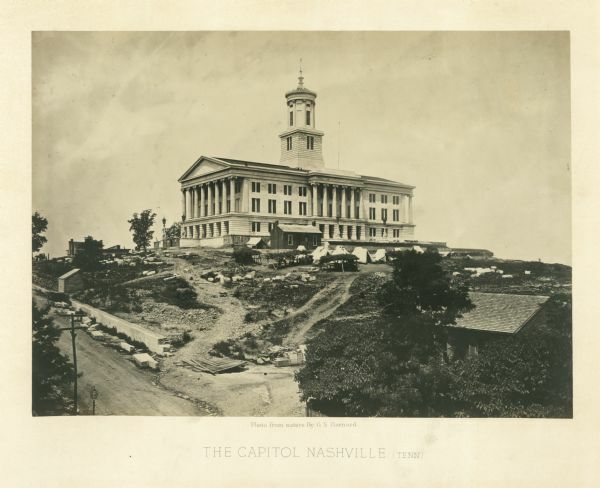 While stationed in Nashville he took pictures of the landscape and fortifications. Many of these photographs were available as panoramas and stereo views. In September 1864 Gen. Sherman took Atlanta and requested Barnard's immediate presence. Barnard captured images of the destroyed rail yards, the scene of Gen. James McPherson's death, and the destruction of Confederate Gen. John Hood's ordnance train. In October of that year, Sherman began planning his famous March to the Sea. Barnard made photographic copies of top-secret maps needed by the Federal Army to complete the march. He also took pictures of many of the buildings targeted for destruction and used his stereoscope camera to capture the demolition. Barnard accompanied the Army on the march but did not take pictures at that time because of the rapidity of the army's movement. Upon the Union's occupation of Savannah, Barnard once again began taking pictures of the destruction. The army continued on to Columbia, South Carolina, where a fire added to the destruction of the city. The war officially ended shortly after, but Union soldiers continued to destroy Southern cities. In March of 1865 Barnard traveled to Charleston, South Carolina, to capture images of the destruction caused by the city being ransacked in February. Barnard also took pictures of Fort Sumter, an important symbol of the war. At war's end in 1866 Barnard began planning his book. He requested maps and went back to Tennessee to begin shooting photographs of the battlefields, which had not yet recovered from the war. He also took more photographs in Charleston, Savannah and Columbia to get more views of the destruction. George Barnard was born in Coventry, Connecticut in 1819. After his father's death in 1826, his family moved to Sauquoit in central New York State. After relocating to Nashville, Barnard returned to Sauquoit for a few years and married his wife, Sarah Jane Hodges. The couple next moved to Oswego, New York, where he began a career as a daguerreotypist in 1846. He ran a successful portrait studio and campaigned to have photography elevated to an art form. In 1853 Barnard took at least two daguerreotypes of the great Oswego fire, considered some of the first products of photojournalism. Barnard stayed current with changes in photography, experimenting with new processes as they were developed. Starting in the late 1840s or early 1850s the Barnard family had some private complications. While his wife Sarah and daughter Mary Grace stayed behind, Barnard focused on New York City for his photographic career. It was there that he started working relationships with Edward Anthony and Mathew Brady. Anthony owned the largest American business devoted to photographic supplies, and they employed Barnard to shoot stereoscopes around New York as well as sending him to Cuba in 1860. After the Civil War Barnard continued working as a photographer. He worked in New York first and then relocated to Charleston in 1868. In 1871 he moved to Chicago, only three months before the great fire. He took photographs of Chicago after the fire, images reminiscent of the destroyed Southern cities he had photographed during the war. He then returned to Charleston in 1873. In 1880 he moved to the suburbs of Rochester, New York, to be near his daughter. He stayed current with new technologies in photography and became acquainted with the new dry-plate process being developed by George Eastman, founder of Eastman Kodak. Eastman hired Barnard to introduce more photographers to the process. He retired from active work in 1888 but continued to experiment with photography until his death in 1902. Barnard's original spellings for locations have been retained in the titles of the images (e.g., "Fort Sumpter" and "Savanah" instead of Fort Sumter and Savannah). We have retained his original spelling for the titles of the images, but have used modern spelling in the descriptions.